The unseasonal ropey weather made for some tough GT popping conditions but we still managed some reasonable fish. Tomo took the opportunity to test out some new prototype rod designs as well as a couple of new design Craft Bait Stickbaits. 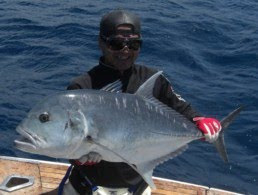 One will go home for more developement but the other proved to be dynamite on the GTs and the mackerel too ! We hooked a few monster fish on the jigs, almost certainly big dogtooth tuna, but with bite-offs and bust-offs, no big doggies released this time. Pleanty of coral trout and groupers for dinner though !